A device mapper target implements particular functionality. For example if you want to write a device mapper for "zeroing" then target code would make sure that for every read it returns zeroed data and write operation can be dropped silently. Device mapper target may or may not modify original data, it depends on functionality to be implemented. Data can be modify for encryption functionality. Device mapper creates a virtual layer of block device and maps all the IO requests on this logical layer to underlying device. Mapping table has information about mapping of sectors on virtual layer to sectors on underlying device. Whenever you want to implement a functionality on a block device, you need to write device mapper target for same. 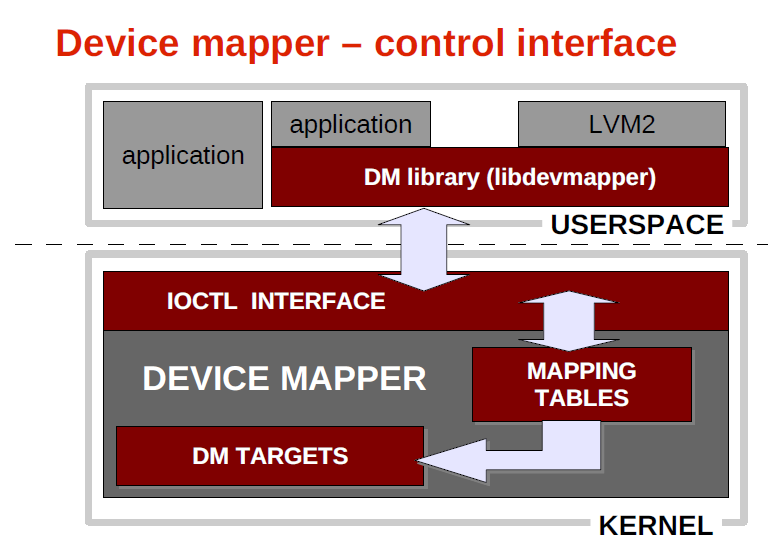 Device mapper is a modular kernel driver which provide generic framework for volume management. LVM is good application of device mapper. Now, lets see demo for linear device mapper. Writing target for linear device mapper. * This is constructor function of target gets called when we create some device of type 'hello_target'. * i.e on execution of command 'dmsetup create'. It gets called per device. * This is destruction function, gets called per device. * It removes device and decrement device count. 1. Make a file of 1Gb using dd command. ->check man page of losetup. Now use cp, mv, touch, rm etc.